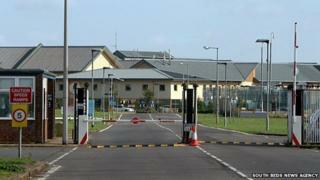 More women will be employed at Yarl's Wood immigration detention centre after complaints of "inappropriate behaviour" by male staff towards female asylum seekers, the government has said. Home Office minister Lord Bates told the House of Lords the share of female staff would rise from 42% to 60%. The House had heard reports of harassment continued, despite sackings over sexual misconduct allegations. Operator Serco said it was currently recruiting more female staff. The Bedfordshire facility houses up to 400 women under threat of deportation. In 2013, two guards were dismissed for inappropriate sexual contact with a woman detainee. A Serco spokesman said there had been 31 investigations of alleged inappropriate behaviour by staff since 2007. Thirteen employees were disciplined, with six subsequently dismissed, before 2013, he said. Serco's contract was extended for eight years last November. But Labour peer Joan Bakewell told the House of Lords a recent report from pressure group Women for Refugee Women (WRW) alleged "inappropriate behaviour by male staff towards female inmates" was continuing. It reported women being watched while they were showering, dressing and using the toilet, she said. Baroness Bakewell asked Lord Bates "when innocent women who have committed no crime can expect to be treated with respect". The minister said prison inspectors had found the facility to be "safe and secure" but the WRW report said inmates had "felt their privacy was invaded". "One of the key elements in the contract that was offered was to say the proportion of female staff had to increase - that is going up from 42% to 60% and I think that's a step in the right direction," he said. Norman Abusin from Serco said inspectors had reported "a high proportion" of detainees felt they were treated with respect. "Any claims of misconduct are treated extremely seriously, are fully investigated and appropriate disciplinary action is taken," he said. "Over the past year we have successfully recruited a number of women to Yarl's Wood and we aim to continue to do so for the rest of this year."